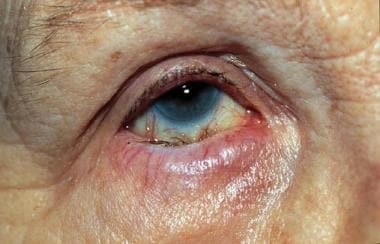 Entropion is a malposition resulting in inversion of the eyelid margin. The morbidity of the condition is a result of ocular surface irritation and damage. Successful management of this condition depends on appropriate classification and a procedural choice that adequately addresses the underlying abnormality. Involutional entropion. Note overriding orbicularis oculi muscle, eyelid margin entropion, and relative enophthalmos with deep superior sulcus. The pathophysiology depends on the type of entropion seen and is discussed below. The primary morbidity is ocular surface irritation. Corneal abrasions and scars can occur. Entropion has no sexual predilection. Although all ages can be affected, entropion is seen primarily in older adults. Awan MA, Chadha V, Gonzalez P, Diaper CJ, Cauchi P, Kemp EG. Small tarsal plates causing recurrent lower lid entropion in a young adult. Eye. 2009 Feb 6. [Medline]. Pasco NY, Kikkawa DO, Korn BS, Punja KG, Jones MC. Facial nerve paralysis: an unrecognized cause of lower eyelid entropion in the pediatric population. Ophthal Plast Reconstr Surg. 2007 Mar-Apr. 23(2):126-9. [Medline]. Maycock NJ, Sahu DN, Mota PM, Gaston H, Hodgkins PR. Conservative management of upper eyelid entropion. J Pediatr Ophthalmol Strabismus. 2008 Nov-Dec. 45(6):377-8. [Medline]. Gu J, Wang Z, Sun M, Yuan J, Chen J. Posterior lamellar eyelid reconstruction with acellular dermis allograft in severe cicatricial entropion. Ann Plast Surg. 2009 Mar. 62(3):268-74. [Medline]. Swamy BN, Benger R, Taylor S. Cicatricial entropion repair with hard palate mucous membrane graft: surgical technique and outcomes. Clin Experiment Ophthalmol. 2008 May. 36(4):348-52. [Medline]. Hintschich C. Correction of entropion and ectropion. Dev Ophthalmol. 2008. 41:85-102. [Medline]. DeBacker CM. Entropion and Ectropion Repair. Medscape Reference. Available at http://emedicine.medscape.com/article/1844045-overview. Accessed: May 2011. McCord CD Jr, Chen WP. Tarsal polishing and mucous membrane grafting for cicatricial entropion, trichiasis and epidermalization. Ophthalmic Surg. 1983 Dec. 14(12):1021-5. [Medline]. Koreen IV, Taich A, Elner VM. Anterior lamellar recession with buccal mucous membrane grafting for cicatricial entropion. Ophthal Plast Reconstr Surg. 2009 May-Jun. 25(3):180-4. [Medline]. Bartley GB, Kay PP. Posterior lamellar eyelid reconstruction with a hard palate mucosal graft. Am J Ophthalmol. 1989 Jun 15. 107(6):609-12. [Medline]. Cheung D, Sandramouli S. Consecutive ectropion after the Wies procedure. Ophthal Plast Reconstr Surg. 2004 Jan. 20(1):64-8. [Medline]. Christiansen G, Mohney BG, Baratz KH, Bradley EA. Botulinum toxin for the treatment of congenital entropion. Am J Ophthalmol. 2004 Jul. 138(1):153-5. [Medline]. DeBacker CM. Entropion and Ectropion Repair. Medscape Reference. September 23, 2011. [Full Text]. Dortzbach RK, McGetrick JJ. Involutional entropion of the lower eyelid. Ophthalmic Plast Reconstr Surg. 1983. 2:257-267. Ho SF, Pherwani A, Elsherbiny SM, Reuser T. Lateral tarsal strip and quickert sutures for lower eyelid entropion. Ophthal Plast Reconstr Surg. 2005 Sep. 21(5):345-8. [Medline]. Khan SJ, Meyer DR. Transconjunctival lower eyelid involutional entropion repair: long-term follow-up and efficacy. Ophthalmology. 2002 Nov. 109(11):2112-7. [Medline]. Millman AL, Katzen LB, Putterman AM. Cicatricial entropion: an analysis of its treatment with transverse blepharotomy and marginal rotation. Ophthalmic Surg. 1989 Aug. 20(8):575-9. [Medline]. Quickert MH, Rathbun E. Suture repair of entropion. Arch Ophthalmol. 1971 Mar. 85(3):304-5. [Medline]. Involutional entropion. Correction of entropion with eyelid retractor reattachment and lateral canthopexy. Cicatricial entropion of upper eyelid. Note eyelid margin inversion. Cicatricial entropion of the upper eyelid with eyelid everted. Note scar tissue involving tarsal conjunctiva. Left lower eyelid cicatricial entropion with lower eyelid retraction. Repair of left lower eyelid cicatricial entropion and retraction with cicatrix release and hard-palate mucosal graft.